The People of Fernando do Noronha. 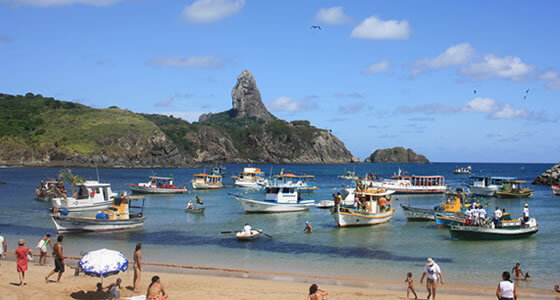 So, you've been wondering how is the people in the paradise fisherman village of Fernando de Noronha? Fernando de Noronha has been home to various inhabitants throughout the past few centuries including prisoners, gypsies, pirates and military personnel and has seen invasions by Dutch, British, French and Portuguese nationals. Prisoners have included political personalities, capoeristas, when the art was banned in Brazil in the late 1800’s and members of infamous bandit gangs. Charles Darwin also visited the island in 1832 en route to the Galapagos, in his research vessel, The Beagle.The varied history of the island is also represented in the various myths and legends that have been passed down from generation to generation and find themselves in the poetry and songs of the island as well. Today, in keeping with the government’s strict protection policies, the number of inhabitants is restricted to around 2000. Most of the population works in the hospitality industry, catering to the visitors of the island, which includes food and accommodation, diving, snorkeling and other water sport instruction and equipment rental and private transportation. Several inns and lodges are family run, while other occupations include fishing, civil services such as public administration and agriculture.The locals are friendly and inviting and though language sometimes poses a problem, they will make every effort to understand and accommodate visitors. They will, for example, gladly offer you a ride in their vehicle if going in the same direction. The atmosphere is very laid back and has the air of a small town, barring a few luxury hotels.Everybody seems to know everyone else and it is common to find unlocked car doors, keys in motorbikes and open home windows. The island is thus very safe and incidents of crime are practically nonexistent. Still, a police establishment does exist with a handful of policemen. Due to the limited number of people allowed to live on the island as well as restrictions on the number of visitors, the island maintains a kind of exclusivity for which the locals charge rates much higher than found on the mainland. The awareness among locals of the environmental concerns is slowly increasing as they are becoming more aware of the role that they have to play in the conservation of this fragile environment and an increased number of inhabitants, especially youngsters are participating in consciousness and training programs offered by various organizations - such as The Spinner Dolphin Project - especially in programs which promote eco tourism.